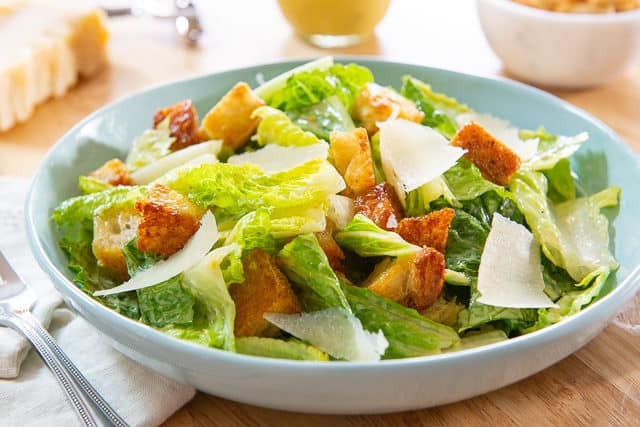 This Caesar Salad is the real deal, just like what you’d get from a high-quality restaurant. 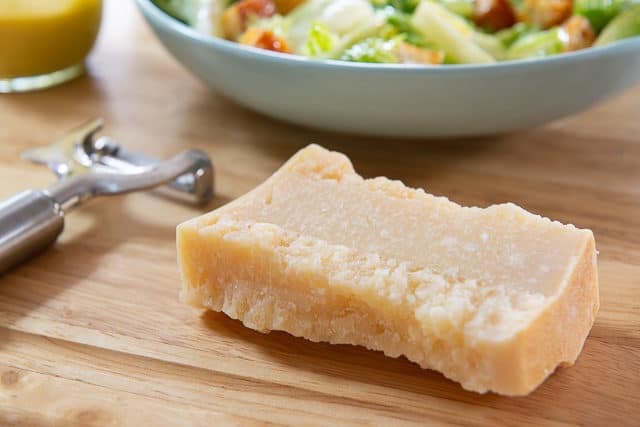 With homemade Caesar dressing, fresh croutons, and shavings of parmigiano reggiano, it’s easy to prepare and so delicious! A good quality Caesar salad is one of my favorite things ever to eat. It’s understandably one of the most popular dishes at restaurants around the world, but I can’t even remember the last time I ordered it when dining out, simply because it’s so easy to do yourself. In this post, I’m going to share a few tricks for an amazing salad. Things that you may not even think about, like making sure the romaine is super cold and crisp. It isn’t just about the ingredients you’re using, as factors like temperature can make such a big difference in how refreshing and enjoyable the salad is. For an amazing Caesar salad, I think it’s 100% mandatory to make the dressing from scratch. I’ve seen some recipes on the internet that call for using mayonnaise as a shortcut, but I don’t recommend it, as the flavor isn’t quite right. Since mayonnaise typically uses the whole egg, the egg white can make the dressing taste too eggy. 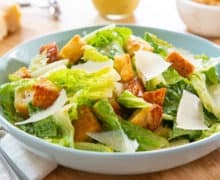 Instead, follow this Caesar Dressing recipe, where we use only the egg yolks, and whip the dressing fresh, from scratch. I made a whole separate post with directions so you can see all the photos from start to finish. 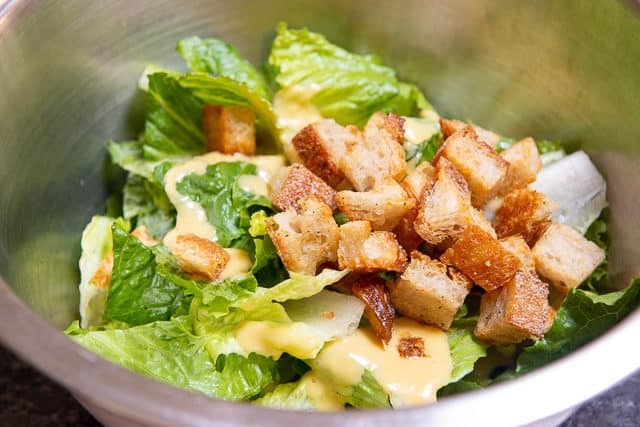 An awesome Caesar Salad will also include fresh, homemade croutons, made with a great-quality bread. The problem with storebought croutons is they have no moisture to them, because they must have a long shelf life. Fortunately, homemade croutons are really easy to make. 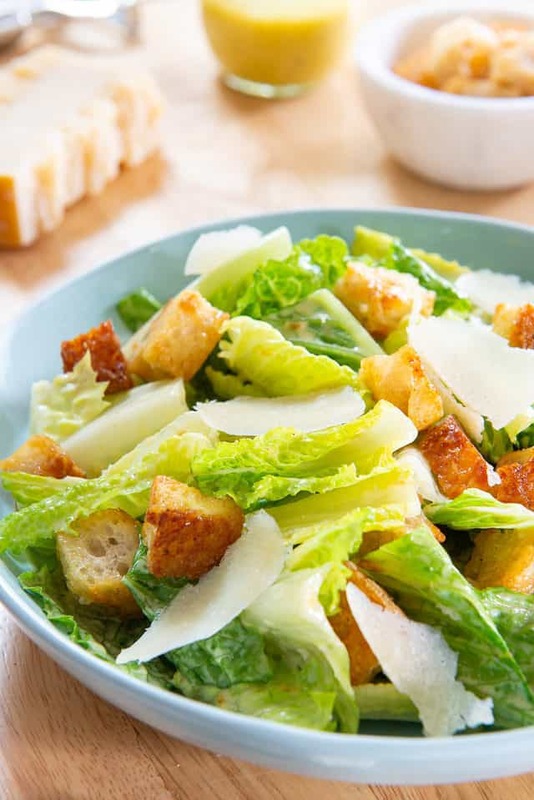 Follow this post for how to make Croutons, and know that you can use that formula for adding croutons to any type of salad, not just Caesar. In order to have chilled and ready romaine, I cut and wash it when I get home, spin and towel dry it, then store it in the fridge. Romaine hearts are sturdy, and actually keep surprisingly well after being washed. The other benefit to this is you know the romaine is going to be dry when you’re ready to use it. Watery greens can easily ruin a salad because the water dilutes the dressing, so you want the greens to be as dry as possible. If you’re in a rush, you can also soak romaine in ice water to chill it, but you have to quickly dry it, toss, and serve. If you prefer, you can toss the cheese with the salad, and you can also grate it finely with a microplane if you prefer a lighter texture. I love pairing Caesar salads with a heartier beef main dish, like Beef Wellington or Lasagna. Enjoy! Can Caesar Salad be made without romaine lettuce? The only other green that I like with the Caesar flavor profile is kale, particularly lacinato kale (which also goes by the names dino kale and tuscan kale). 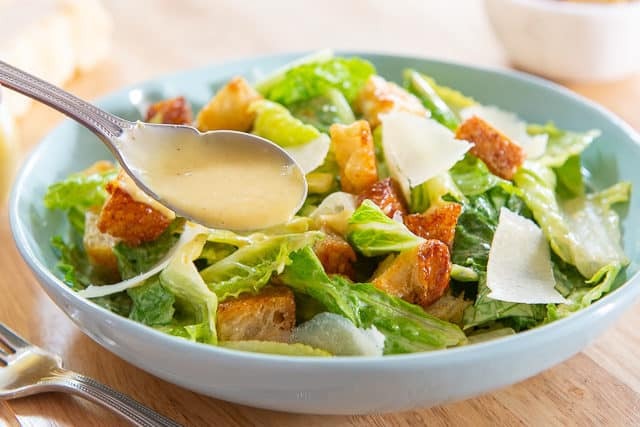 With homemade Caesar dressing, fresh croutons, and shavings of parmigiano reggiano, this Caesar Salad is easy to prepare and so delicious! Chop the romaine into pieces, about 2 inches in length. You may also keep the leaves whole for serving, if desired. Place the lettuce into a large mixing bowl, and quickly toss with the dressing and croutons. Add more dressing if desired (it should be generously coated, and when you taste a piece, the dressing should be prominent). Plate the salad into two bowls, then add the shaved parmigiano reggiano on top. Serve immediately while still cold, and enjoy! *Equal to about 8 cups of loosely packed chopped romaine. For extra credit, chill everything in advance, including the tossing bowl, and the serving bowls, to keep the salad cold. It is so much more refreshing when the romaine is cold. Post updated in January 2019. Originally posted October 2011. I want those croutons!! Just to snack on, who needs the salad they look so good! I’m not squeamish about egg yolks, but those who are can buy pasteurized. I’m sure they’re pricier, but it’s not like you’d need a bunch. In any case, this is a good switch. Love the croutons. Yes, homemade dressing is always better. I walk straight past the dressing aisle at the market. Those croutons look absolutely delicious! Really makes the salad. 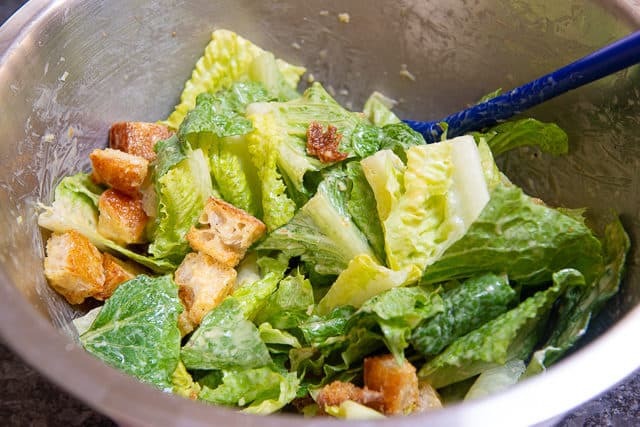 You can find several kind of dressing for Ceasar salad in the market, but there is nothing like the one that is home made. Mmmm, Parmesan cheese, bread, ceaser dressing! Be still my heart!